The part with frame-ancestors is to protect against clickjacking. Why is this report sent? I can't reproduce it. 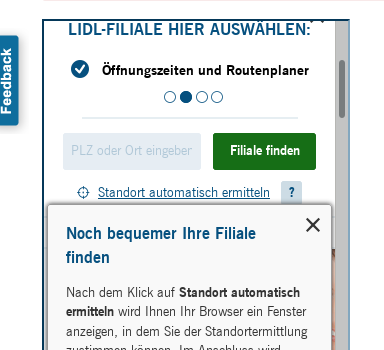 Why is the "original policy" altered ('self' vs. https://www.lidl.de)? Does this make any difference? (EDIT) Why is https://www.lidl.de/ blocked in the following report? The csp explicitly allows iframes on the same site via 'self'. If you can reproduce the CSP violation or can trigger other violations I would be happy to learn about them. 'self' in the CSP actually stands for "same domain". It is just a placeholder, so this is evaluated by browsers to, in your case, https://www.lidl.de. That's exactly what you say the directive should do, it is just written in another way. So no, it does not make a difference. I am nearly sure that in 90% of these cases the answer is: browser add-ons. If you really cannot reproduce it with a clean profile and same browser/same site, it is very likely just a browser extension injecting respectively trying to inject some stuff. That is a very common source/trigger for CSP reports. That should fail, and trigger the CSP report. Because that is what clickjacking is about: Your site getting embedded in another site, in such a way the user does not see it and clicks on things, the user did not want to click on. I know Report-URI has some filters to prevent such reports caused by browser add-ons, but they still cannot catch all of them. It does, but you may actually (better, or, even better: additionally) use the header X-Frame-Options for that purpose. This header was designed for that, and also works with browsers, who do not support CSP (it is older, in any case). See the security headers scan from the same author as Report-URI for more details. While you are at it, you may also have a look at the other security headers. Not the answer you're looking for? Browse other questions tagged content-security-policy clickjacking or ask your own question. CSP allowing all Google domains?